by PaulEMoz in "Amiga", "Commodore", "Electronic Arts", "Elite", "Star Flight", "space", "trading"
I can't tell you how long I've been wanting to play Star Flight. After The Bard's Tale had ensnared me on the Commodore 64, I had been bitten by the complex games bug, and seeing this on the C64 really piqued my curiosity. But I didn't have a disk drive at the time, and when I did get one I'd either forgotten about this or just didn't bother hunting it down. In truth, I blame Wasteland for that. So it was with some excitement that I saw this in my Amiga pile. I was immediately put off, though, when upon opening the box I was confronted with the deranged scribblings of a confined lunatic. Gibber gibber, scribble. Make any sense to you? No, me neither. Actually, it's quite understandable. 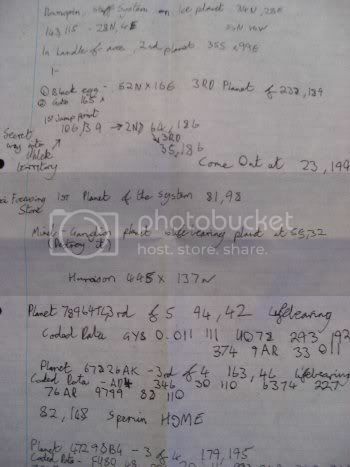 My mate Stephen, who gave me his Amiga, always used to write notes when playing complex games, which makes sense as you'd need to refer to or remember this stuff maybe months later on in the game. Loads of his game boxes are littered with scraps of paper that look like something that would lead you to the Holy Grail, when really they just lead you to the planet with the best mining potential in a game. In terms of the game, it was really difficult for me to get going. What with a huge manual and code wheel, there's a hell of a lot to get to grips with, something which seemed easier when we were teenagers. And probably was, come to think of it. Also, the disk is filled with saved games. And there doesn't appear to be a way to start a new game, at least, not without making a new backup of the original. And I couldn't be bothered with that, either. So I set out into the galaxy in the Starship Enterprise, with Kirk and crew at large. Cheers, Stephen. Still, difficulties aside, the time I spent in the game showed much potential. I did manage to pick out a planet on the star map, made my way there without confrontation, landed safely, drove about on the planet, mined a bit, made my way back to the ship, and took off back into the planet's orbit. Not bad going. Next will come the job of finding somewhere to sell my stuff. Star Flight is obviously a game that you could play for years. I don't know if I'll be committing to that, but I'm happy to have finally had the opportunity to play it, and to know that it's there if I feel like having another crack at it.